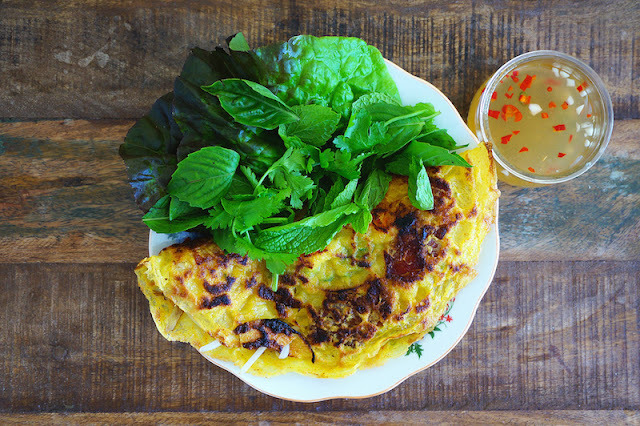 This is a fantastic Vietnamese-Style Crispy Pancakes recipe, or also known as Banh Xeo in Vietnam. The texture of the pancake is light and crispy. As for the filling, I have added some bacon slices, shrimps, onion, and bean sprouts. The combination is just perfect. Dipping Sauce: Combine sugar and warm water, stir until sugar dissolves. Then mix in the chilies, garlic, fish sauce and lime juice and set aside. Batter: Combine the batter ingredients in a bowl and stir until well blended. Refrigerate overnight. Bring it back to room temperature before cooking. Heat 1 Tbsp of the oil in a wok over medium-high heat. Toss in the bacon, if using, prawns and onions. Sauté briefly until the prawns turn pink and fragrant. Scoop some batter into the wok, gently swirl the wok, make sure the batter cover all the ingredients. Cover and let it cook briefly, until the batter set. Brush some oil on the edge of the pancake and let it sizzle and it will be crispier. Top with some bean sprouts, cover and cook for another 2 to 3 minutes. Fold the pancake in half, remove and transfer to a plate. Continue with the remaining ingredients and batter. To Serve: Break a piece of pancake and place lettuce leaf with some herbs, wrap it up and dip with dipping sauce.